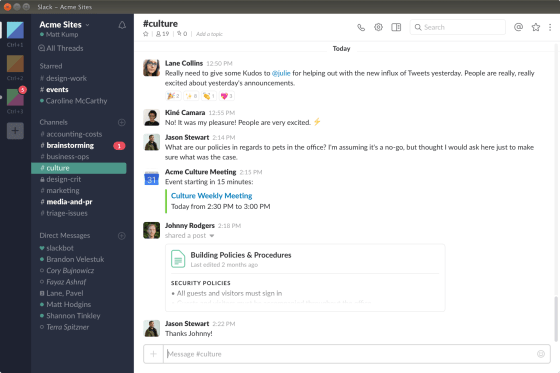 London, UK – 18th January 2018 – Canonical, the company behind Ubuntu, today announced the first iteration of Slack as a snap, bringing collaboration to open source users. In adopting the universal Linux app packaging format, Slack will open its digital workplace up to an-ever growing community of Linux users, including those using Linux Mint, Manjaro, Debian, ArchLinux, OpenSUSE, Solus, and Ubuntu. Snaps are containerised software packages, designed to work perfectly and securely within any Linux environment; across desktop, the cloud, and IoT devices. Thousands of snaps have been launched since the first in 2016, with snaps’ automated updates, added security benefits, and rollback features, with the option for applications to revert back to the previous working version in the event of a bug.